2018 NRS Studio 54 Theme Party! Pictured Rocks National Lakeshore is beautiful place to paddle. 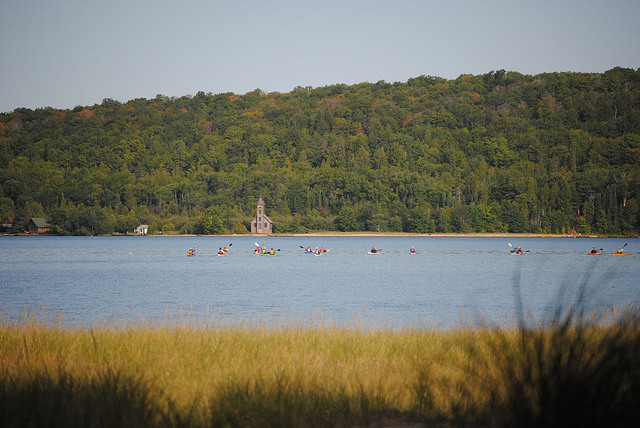 That’s why Ladies of the Lake has settled down in Munising. From soaring cliffs, sea caves, and waterfalls to rolling rivers and protected bays, this area offers something for everyone and we offer guided tours that will take you there. It’s a great way to get out and see and the area and take a break from the rigor of classes. Our tours are a full day affair and will take you to some of the most beautiful shoreline that Pictured Rocks has to offer. If you sign up for a tour you will be unable to take a class on that day. We have tours for every level of paddler, from the first time boaters to seasoned pros. During your registration you will fill out a self evaluation that will help you determine your level of skill and experience. At the end of the evaluation you will be given a color that corresponds with your skill set and will help you choose tours and classes that are most appropriate for you. Every time you see that color on this site you can know that that tour or class fits into your level of experience. This isn’t to say it won’t push you and help you become a better paddler. You are more than welcome to take tours and classes that don’t match your color but please be aware that they may not sufficiently challenge you or they may require some skills that you haven’t gotten yet. All tours will meet at LOL headquarters in the upstairs of 387 Restaurant. All of the tours require some travel. You will be responsible for your own travel from Sydney’s to start of the tour and we highly recommend car-pooling with other tour participants. The time on the schedule is the time that the tour will depart from 387. It is required that you be at headquarters at least a half hour before this time. Anyone late for their tour runs the risk of being left behind. This time will give you a chance to organize carpooling and get any last minute instructions. Please have all of your paddle gear ready to stow in your boat and all of paddle clothing ready to put on when you arrive at your tours starting point. There is no need to dress for the water as there is some travel with all tours. Lake Superior is unpredictable. We hope the weather will cooperate during the symposium but there is not way to guarantee that the Lake is on bored. That being said weather rules the lake and we have several good alternatives planned in the event that Lake Superior and Mother Nature fail to cooperate. At the end of the day the guides have the final say, and safety is their primary concern. Be prepared to be flexible with your tours. Tours are an all day event. No food will be provided during the tour. You are on your own for lunch and any snacks you may want during the day.